We who served at Field Station Berlin on Teufelsberg in Berlin invite you to help us SAVE TEUFELSBERG! We are writing to the U.S. Senate and Congress suggesting that they pass a Sense of the Congress Resolution that calls for Teufelsberg to be turned into a Cold War Monument commemorating all the allies who stood shoulder - to - shoulder with the West Berliners and West Germans. There are other important organizations to write to, and we will name all that we know about. Look above at the beautiful photo above of Field Station Berlin atop Teufelsberg as it was in the 1992, when Field Station Berlin furled its colors for the last time. It doesn't look like that any more. It's a burned out shell. Since it was abandoned by the Allies in 1994, most of its structures have been severely damaged by vandals and arsonists. Take a look at photos of how it was in 2004 at http://fiedel.dyndns.org/teufelsberg/pix -- It is worse now. It is horrible to look at. It is a ghastly thing to see what has become of what was once a proud military station, but it is not completely gone. There is still a chance it could be preserved as a memorial. Now the former Field Station Berlin base on Teufelsberg is in danger of total destruction. The German government is on the verge of deciding to raze it to the ground. We who served there do not want that to happen! Teufelsberg is a tall heap of World War Two rubble upon which were built high tech radio sentinels which ensured peace through vigilance for Germany, and for Europe. This electronic listening post was called Field Station Berlin. For fifty years, people there helped prevent the Cold War from turning hot and creating more rubble. The men and women of Field Station Berlin lived up to their motto "On Watch." Let us SAVE TEUFELSBERG so that it will not be forgotten by Berlin, by Germany, by America, and by any future enemies who would try to threaten the peace. It can be a lasting memorial to the mutual friendship and peace of peoples who once fought one another in great wars. We veterans of Field Station Berlin propose that we all should work together to bring this proposal to the attention of governmental decision makers on both sides of the Atlantic Ocean, so that Teufelsberg will be preserved in fact, not just in our memories. The way to achieve a goal like ours is to communicate our message. We must write email, postal mail, petition, and then telephone our message. We have a message that we have been sending out that stands alone, understandable to those familiar with our subject, and also to those who are not so familiar. It could be used as a flier, or as a phone script or as a postal letter. Check it out now, and use it yourself, with this SAVE TEUFELSBERG! Letter Link. The letter is both in English and auf Deutsch. or by postal mail to FSBVG, P.O. Box 1601, Laurel, MD, 20725 USA. Include the date sent, the email address, your name, and the title and nationality of the official. Appropriate replies will be posted at our Replies page. SAVE TEUFELSBERG! supporters who live in the States, you can help by writing to the U.S. Senate and Congress, suggesting that our U.S. elected federal legislators pass a Sense of the Congress resolution that calls for the former Field Station Berlin buildings atop Teufelsberg in Berlin, Germany, to be designated the "Major Arthur D. Nicholson" Cold War Memorial, in memory of the last Cold War casualty, the U.S. Military Liaison Mission tour officer who was shot and killed by a Russian sentry near Ludwigslust on March 24, 1985; and in recognition of the countless men and women of the Allied Armed Forces who resolutely stood shoulder-to-shoulder with the West Berliners during the Cold War, ensuring that the island of freedom known as "West Berlin" remained free. While the Sense of the Congress is not law in Germany, it would raise the profile of the Save Teufelsberg! campaign, and would suggest to the political powers-that-be in Berlin that we should be taken seriously. If we all write our Senators and Congressman, we just might get this done. Thus, it seems appropriate that U.S. Senator Lieberman should lead the way in this action. If you are a resident of Connecticut, PLEASE write to Lieberman. If you don't live in Connecticut, write to your own Senator. Senator Lieberman is responding with an ignoring form letter to requests from those not in his state. Sense of the Congress Resolution page. Email addresses on this page are not clickable to prevent SPAMers from harvesting them. To send an email to one of these addresses, replace "(at)" with "@" when you paste the address into a new mail form. Email is easy to send, but honestly, actual postal mail, even post cards, and phone calls are taken more seriously by decision makers, so we will provide postal address and phone numbers, too, when available. You will find sample notes to send to all the organizations below the organization lists. Send English first, then German, yours or mine or some combo. It's the number of notes that are sent that counts the most, not how neat they are, but do include your name and address. Anonymity is not acceptable. Telephone comments are also very influential: 202-456-1111 (this is a toll call). Suggested text to use when communicating with your Senators and Congressmen and the President and Vice-President about this issue. Use it as it is, or rewrite it to add your own special insights. "I urge you to support a Sense of the Congress resolution to designate the former U.S. Field Station atop Teufelsberg in Berlin, Germany, as the "Major Arthur D. Nicholson" Cold War Memorial, in memory of the last Cold War casualty, the U.S. Military Liaison Mission tour officer who was shot and killed by a Russian sentry near Ludwigslust on March 24, 1985; and in recognition of the countless men and women of the Allied Armed Forces who resolutely stood shoulder-to-shoulder with the West Berliners during the Cold War, ensuring that the island of freedom known as "West Berlin" remained free. Because the facility stands on one of the highest points in Berlin, it can be seen for miles in every direction. Brightly lit at night, it would be a constant visible reminder of Allied resolve to defend Berlin during the Cold War, and of Allied friendship with the newly reunited Germany. The Field Station main building would make an excellent annex for the Allied Museum in Berlin, which is currently located in the old U.S. military movie theater called "The Outpost," located near the former U.S. Headquarters on Clayallee." The German government can help if we write to them. Letter mail to Germany from the U.S.A. costs $0.94 per ounce. sent us a letter requesting that we not write to them, but rather to the Petition Committee (Petitionsausschuss) for the Abgeordnetenhaus von Berlin, which is the state, as opposed to Federal (Bundestag/Budesrat) legislature for the state (Land) of Berlin. They note that "Save Teufelsberg!" is a local government issue. Read that letter on our Replies Page. "Geschäftszeichen: 4011/16, Bearbeterin: Frau Kramm". They only want to keep one file open on the issue. It seems a reasonable request. We now have a file number, ergo we exist. The President and Vice President of the Bundestag, on the other hand, have come out in favor of a monument to commemorate many of the same things that the FSBVG campaign wants to commemorate with the the "Major Arthur D. Nicholson" Cold War Memorial. Read a brief English summary of their comments on our "German Politicians on the Need for a Monument" page, where you will also find their addresses so that you can contact them and let them know that you want to Save Teufelsberg! The political process in Berlin includes the formal submission of written questions by the Abgeordnetenhaus (Legislature) to the Senate (Executive Branch). In 2008, the FDP Shadow Minister for Urban Development in the Abgeordnetenhaus, Albert Weingartner, submitted a series of questions to the Senate on Teufelsberg. Read the FSBVG translation of the Senate's official response on our "News" page, where you'll find out how to WRITE TO Deputy Weingartner to let him know that he should ask more questions about Teufelsberg! Read the letter of reply now. This is the organization that regulates Monuments in Berlin. They will have to approve any plan to turn Teufelsberg into a monument. Their English-language contact page is http://www.stadtentwicklung.berlin.de/denkmal/denkmale_in_berlin/en/kontakt/index.shtml or you can write to landesdenkmalamt(at)senstadt.berlin.de today. Read her letter of reply now. Baustadtrat Klaus-Dieter Gröhler is a key player in the decision making process that will determine if we can Save Teufelsberg or not. We encourage all Friends of Teufelsberg, especially in Berlin, to write to Herr Gröhler. 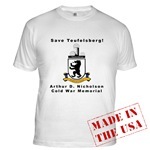 Be sure to write him and let him know you want to Save Teufelsberg! Use the sample letter below, or use your own words, but write. Field Station Berlin veterans in the States should not hesitate to write all these in English. "The remaining segments of the Berlin Wall are stark monuments to the folly of the failed ideology that split Germany apart. We also, however, need monuments to the positive aspects of the Cold War, monuments to the friendship and steadfast support of the Western Allies who made the reunification of Germany and Berlin possible. I think that the buildings of the former Field Station Berlin atop Teufelsberg are the best choice for such a monument. I encourage you to do everything possible to have them designated a national monument." "Die übergebliebene Segmente der Berliner Mauer sind grelle Denkmäler zur Unsinnigkeit einer gescheiterten Ideologie, die Deutschland geteilt hat. Wir benötigen jedoch auch Denkmäler zu den positiven Aspekten des kalten Krieges, Denkmäler zur Freundschaft und unerschütterlichen Unterstützung der westlichen Alliierten, die die Wiedervereinigung Deutschlands und Berlins ermöglichten. Meiner Meinung nach sind die Gebäude der ehemaligen Field Station Berlin auf dem Teufelsberg die beste Wahl für solch ein Denkmal. Ich ermutige Sie alles mögliches zu tun um sie zum nationalen Denkmal zu benennen." Friends of Teufelsberg who still live in Germany and Berlin, please know that veterans of Field Station Berlin have heard your requests for us to come to Berlin to speak to your parliament and newspapers and to assist you in your fight to preserve Teufelsberg as a monument to the defense of Berlin during the Cold War by the Western Allies. We would all love to return to Berlin anytime, especially to help Berlin and Teufelsberg again. However, we are now private individuals who do not have the funds -- especially in these difficult economic times -- to travel to Berlin for this purpose. For that reason, we humbly suggest that you contact the organizations below to seek their assistance in organizing funding for a group of Field Station Berlin veterans to travel to Berlin to participate in a conference on turning Teufelsberg into the kind of monument we are proposing. Please also write to the following organizations about our need to SAVE TEUFELSBERG ! Field Station Berlin veterans in the States might wish to write them at nyoffice(at)americanacademy.de as soon and often as possible. The Allied Museum (Das AlliiertenMuseum) tells the amazing story of the half century long presence of the Western Allies in Berlin. The USA, Great Britain, and France marched into Berlin as victors and occupiers in 1945, and left as friends almost 50 years later. The Allied Museum would undoubtedly be a willing participant in the organization and staging of a conference to SAVE TEUFELSBERG. The contact page says that the Museum's email address is info(at)AlliiertenMuseum.de -- Field Station Berlin veterans in the States should not hesitate to write them in English. The job of the Public Affairs Section is to promote understanding of U.S. political, economic and social issues -- explaining the complexities of U.S. society and culture to German audiences. They would seem the most logical point of contact at the Embassy. The home page for the Embassy is http://germany.usembassy.gov . Peter R. Claussen is the Cultural Attaché at the Embassy. The Embassy's contact form is at http://germany.usembassy.de/email/feedback.htm . There is a limit of 450 characters on the contact form. The Association of Western Allies in Berlin. "German authors and screen-writers have already begun the process of distilling the literary truth of the meaning of Reunification from the German perspective. The perspective of the American Community that existed in Berlin from 1945 to 1994, however, is sadly lacking. JFK is not the only American who felt himself a Berliner. For almost fifty years from 1945 to 1994, there was a large and vibrant Community of American Berliners who stood shoulder-to-shoulder beside the German Berliners, through the Airlift, and through the Wall from rise to fall. This community disappeared together with the Wall, but it too deserves to have its tales of Berlin preserved before they vanish from living memory. I urge you to help support the collection and publication of the stories and memoirs of the American Community in Berlin by bringing American Berliners back to Berlin for a conference where they can tell their stories in person and add their voices to the call to turn the buildings of the former Field Station Berlin atop Teufelsberg into a monument that commemorates the friendship and steadfast support of the Western Allies who made reunification possible." "Deutsche Autoren und Szenaristen haben bereits den Prozess des Destillierens der literarischen Wahrheit der Bedeutung der Wiedervereinigung aus deutschen Perspektive angefangen. Die Perspektive der Amerikanischen Gemeinschaft, die von 1945 bis 1994 in Berlin existierte, läßt jedoch traurig auf sich warten. John Fitzgerald Kennedy ist nicht der einzige Amerikaner, der sich ein Berliner genannt hat. Für fast fünfzig Jahr -- von 1945 bis 1994 -- gab es eine große und vibrierende Gemeinschaft von Ami-Berliners, die Schulter-zu-Schulter neben den Deutschen Berlinern durch die Luftbrücke, und durch die Zeit der Mauer, vom Aufbau bis zum Fall, standen. Diese Gemeinschaft verschwand zusammen mit der Mauer, aber, bevor sie von lebendem Gedächtnis verschwinden, verdienen auch ihre Erzählungen über Berlin erhalten zu worden. Ich ermutige Sie die Ansammlung und Publikation der Geschichten und Lebenserinnerungen der Amerikanischen Gemeinschaft in Berlin zu stützen, durch Ami-Berliner für eine Konferenz nach Berlin zurück zu holen, damit sie ihre Erzählungen persönlich präsentieren können und ihre Stimmen dem Anruf hinzufügen können, um die Gebäude des ehemaligen Field Station Berlin auf dem Teufelsberg ein Denkmal zur Freundschaft und unerschütterlichen Unterstützung der westlichen Alliierten, die die Wiedervereinigung Deutschlands und Berlins ermöglichten, zu erklären." It seems that we have waited until the last minute, so now there is urgency to move us to take action, all of us, as soon and as often as we can. http://fsbvg.org, FSBVG, P.O. Box 1601, Laurel, MD, 20725 USA. Please take a few minutes to view our Field Station Berlin Vets Group website. It is a military vets reunion association and an Internet memorial to Field Station Berlin on behalf of Field Station Berlin veterans in the Field Station Berlin Vets Group. Anyone interested is invited to join the FSBVG. Instructions for joining are on the FSBVG website. Donations fund the expense of publishing our website and FSB related reunion activities. Field Station Berlin Veterans are invited to join the Field Station Berlin Yahoo Group, where we meet again online, look for our old comrades, talk about the good old days of FSB, and plan future reunion activities. Permission to establish Internet Links to this web page is freely granted by the Field Station Berlin Vets Group. All other inquiries to save_tberg (at) fsbvg.org please. Leave a message in our guestbook below with any helpful comments or constructive suggestions regarding our proposal, please. We want to hear from you. "Because the facility stands on one of the highest points in Berlin, it can be seen for miles in every direction. Illuminated by floodlights at night, it would be a constant visible reminder of Allied resolve to defend Berlin during the Cold War." This website is best viewed with Internet Explorer. If the graphics on these pages are misplaced, it is most likely because content is constantly being added and shuffled. Images will be moved around until the result is just right. If you are using Firefox, some of the images on this page may cover some of the text "above" them. Support the campaign to SAVE TEUFELSBERG! Now on sale are campaign logo tee-shirts in several styles, all sizes, colors, and sleeve lengths, plus canvas bags. "Save Berlin!" is a project of EXBERLINER MAGAZINE, which has its online presence at EXBERLINER.com. The monthly slick magazine is an expatriot Berliner publication to present English language perspectives of Berlin. 1. Berlin in 2009 is the coolest city on Earth. It has everything - a vibrant youth culture, high art, generous infrastructure and cheap rent. It's an island of affordable civilization for outcasts and dreamers. Berlin welcomes Turks and Jews, artists and families, punks and bureaucrats, sexual outlaws and party kids. Its dark past and deep scars are integral to its character and appeal. 2. The wrong people are making decisions about Berlin's future. Businessmen and bureaucrats strive to turn the city into a generic European capital. 3. Berlin is in danger. Creeping gentrification is pushing up rents and killing the vibrant mix of cultures. Shopping malls and glass towers push the city toward a bland sameness. History is being wiped away or sanitized beyond recognition. 4. Outsiders should have a voice in deciding Berlin's future. Foreigners who come to this city are inspired by a love for its spirit, history and mythology. They sense what makes Berlin unique and know what should be preserved and cultivated. 5. We are asking Berlin's outsiders to help make Berlin the city it wants to be. We are tapping into this enormous resource of imagination, asking for new visionary schemes for Berlin to inspire debate and build a vision for the city's future. To learn more about the Save Berlin! Campaign, please visit EXBERLINER.com at http://www.exberliner.net !